My 6.5-year-old son and I like to have regular “dates” to reconnect and remind each other that fun is an important part of our relationship. 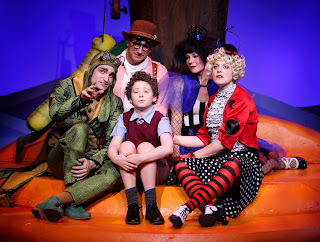 For our most-recent date, we decided to check out a performance of “James and the Giant Peach” performed by the Carousel Theatre for Young People on Granville Island. This live musical is based on the original Roald Dahl children’s classic by the same name. This is the second run of the show for Carousel Theatre. For those that haven’t read the original novel, the general story is that James, an orphan, is sent to live with two horrible aunts. Through a magical encounter with a mysterious man, James accidentally imbues an old peach tree with the ability to produce one very large peach. The same magic also causes several creatures, including a lady bug, centipede, grasshopper, earthworm, and spider, to grow to human size. James and his new friends embark on an adventure that teaches all of them the real meaning of family. Overall, I thought that the play was very well presented. The costuming and set in particular, were absolutely stunning and really brought out the magic of the story. The actors all performed well, with the two horrible aunts (played by Patti Allan and Deborah Williams) being almost too convincing! My son was actually a little afraid of them at the beginning of the show, but he soon started to find them hilarious. The show was 90 minutes with a 15-minute intermission. The first half was honestly a little slow. I was bored, but my son seemed to enjoy it. The second half was much better! It made the performance worthwhile for both of us. 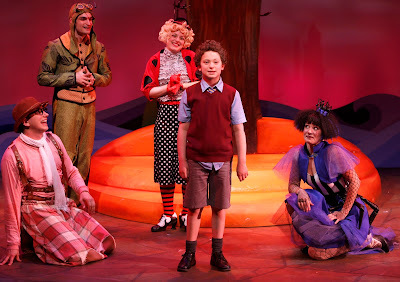 The performance is recommended for ages 6+ and the first scene really underscores why that is. James’s parents are killed by a rhinoceros, and while the scene is presented in the least scary way, my son still said it made him almost want to cry. I’d recommend telling your children before the performance that this will happen so they can be prepared. The other part of the play that startled my son at first (but later he said was his favourite part) was the audience participation. We sat in seats H1 and H2. The aisle next to seats G1, H1, and I1 gets used frequently by Spiker and Sponge, the two evil aunts. It can be very loud, and sometimes they even interact with the people sitting in those seats. However, once my son got used to this idea (and they asked him to hold a martini glass while they sang a song), he thought it was the coolest thing ever. If you have a shy or nervous child, however, I would recommend sitting further in and not in these aisle seats. My son said he would definitely recommend the show to his friends – he gives it four out of five stars. For me, it was a lovely “date” activity, and I would also encourage families with children over the age of six to check it out. The show continues until January 3rd at the Waterfront Theatre, next to the Kids’ Market. Parking can be limited so be sure to arrive early! For show schedule and to purchase tickets check out the Carousel Theatre for Young People website.